This exhibit depicts a revision surgery to repair an improper C4-7 fusion, resulting in an esophageal rupture. The procedure begins by opening the previous incision site on the anterior neck. 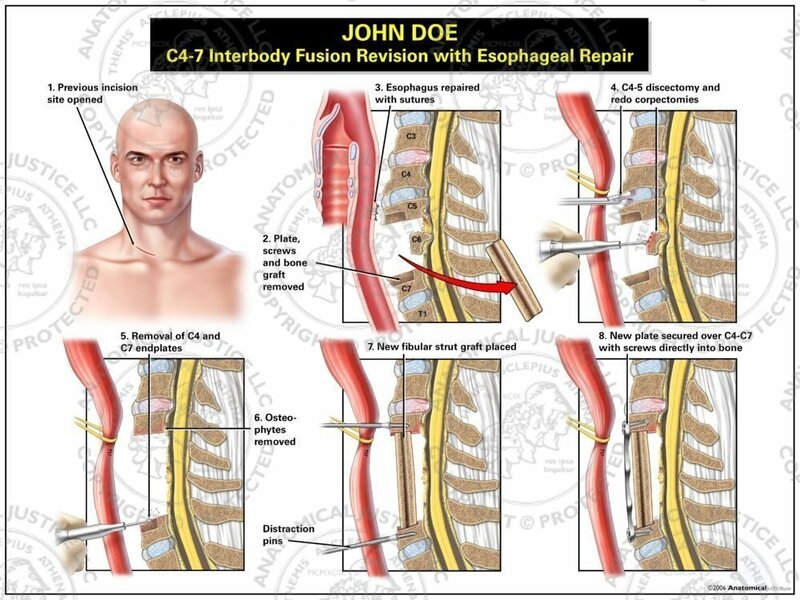 Improperly placed hardware and bone graft are removed, and the esophageal tears are sutured. A discectomy is performed at C4-5, and total corpectomies are completed at C5-6. 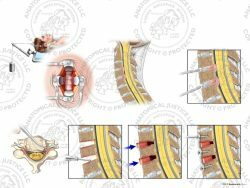 The C4 and C7 endplates are then removed to bleeding bone with a drill. Distraction pins are secured, and a new fibular strut graft is placed into the disc space. Lastly, a new, properly sized plate is affixed to the C4 and C7 vertebral bodies with screws.